The bunny ear decrease I talk about in my older post is what I now prefer to call a 3-to-2 decrease (because it’s descriptive of the action). Here’s the instructions for how to do it. Yes, this makes the stitch count vary. If doing the more densely packed chevrons, end after a row that has a 3-to-2 decrease if you want to end with the same number of stitches that you started with. 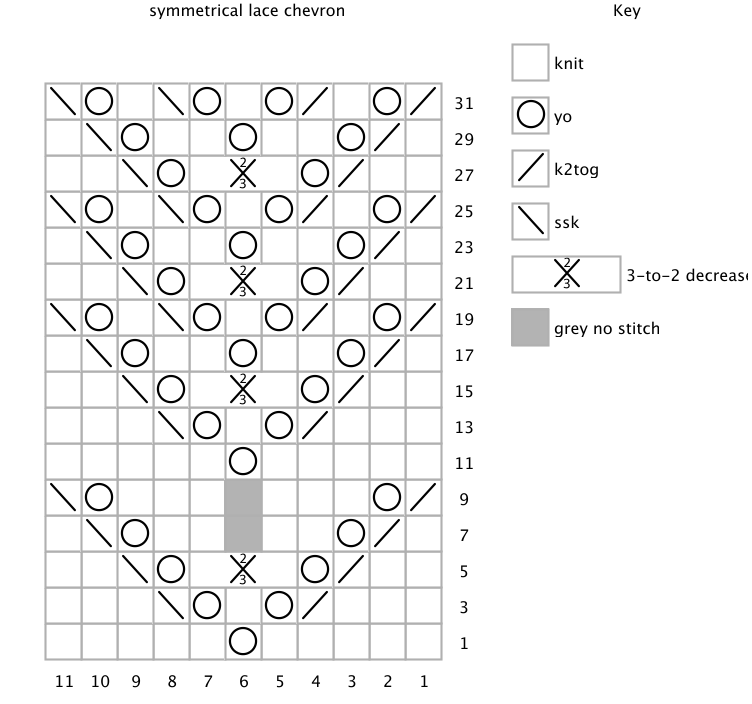 And here’s the chart and written instructions for my swatch above. 3-to-2 decrease: Ssk. Place second stitch of ssk on left needle. K2tog to join second and third stitches. Center stitch of three is decreased away to make two stitches. Use this chevron variation wherever you’d like. This sunny-colored yarn brought to you by a sweater my great-grandmother knit for my mother. It wore out in spots, and I unraveled it for the yarn at a time when I needed yarn and had no money for it. It’s been cloudy and cold; I needed something bright. Also I’m a bit sentimental about it.